We love the Allstays Camp and RV app on our smartphones and use it all the time to find a place to stay in our RV. I know many of you use it as well, but I wonder if you know about its Advanced Filtering? If you use this app, you probably know that you can use the Filter feature and just check off the items that you want to see on your map. For example, I put a checkmark next to Independent campgrounds, Elks places, Army Corps of Engineers parks, Walmarts, and Cracker Barrels, but not next to RV Dealers or Sams Clubs. There’s only so much display room on the map, and I don’t want it to get too cluttered. Each of those categories has its own icon on the map so I can tell an Army Corps park from a Cracker Barrel. It’s quite nice. We are members of Thousand Trails and like to stay in their parks whenever possible. Thousand Trails parks show up on Allstays along with Independent Campgrounds – they don’t have their own icon, or a separate category on the Filtering screen. I was lamenting that there was no box to check for Thousand Trails parks, when someone showed me how to do it! So I want to pass along the favor. Use the Advanced Filtering section. After tapping on Filter, you’ll see a line for Advanced Filtering (Cumulative.) On that screen you’ll see lots more choices, including various clubs like Good Sam, Escapees, Passport America, and Thousand Trails! 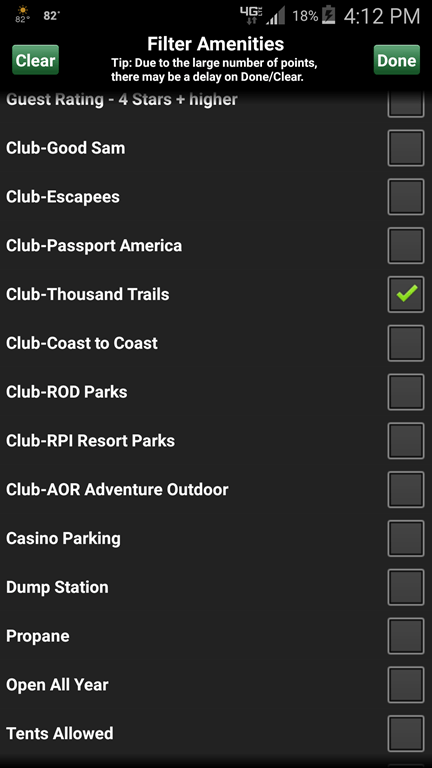 So, I click the checkbox for Club-Thousand Trails, click Done, and then my map shows only Independent campgrounds that are Thousand Trails. Now, how do you get all the other items back when you want? Get back to the Advanced Filter screen and Clear your checkmarks by tapping the green ‘Clear’ button. Notice that the Advanced Filter is cumulative. I know that word ‘cumulative’ sounds like it should show more but in fact it shows less because it’s the filter that is cumulative … adding one filter to another means less data gets thru. More means less – got it? The more you play with it, the more it make sense – just try it! You’ll like it! Published by MrsGeek, in Blog. Tagged with #GeeksWhoTeach, Allstays Camp and RV app, Apps for Travelers, Droid, Geeks on Tour, iPad, iPhone, Smartphones, Technology for Travelers.